Burlington, VT — This week at the Community Sailing Center on Burlington’s waterfront, the Northern Vermont high school sailing team raised their sails for the first time this year. They may not play under the lights, but there’s just as much athleticism, teamwork and positional expertise as any sport. The students are diverse in many aspects, including their school. The NVHSST is made up of sailors from CVU, Burlington, South Burlington, Rice Memorial, Essex, Colchester and some home schooled students. “Without the help of grant support that we write each year, we wouldn’t be able to run such a big conglomerate team.” said Guimaraes. The team’s first regatta is 9/7 at Bowdoin College in Brunswick, ME. BURLINGTON, Vt. – Any person, any age, any skill level can learn to sail. That’s the message behind one unique clinic. Sunday, the Sailing Center teamed up with the Adaptive Sailing Clinic to make that a reality. ABC22’s Chief Photojournalist Steve Longchamp takes us to Lake Champlain for an up close look at these promising sailors in action. “We’re doing an Adaptive Sailing Clinic to generate interest for our programs. We’re trying to get more disabled sailors involved in the programs. We have two Martin 16 sailboats that we sail at Mallett’s Bay and there’s two Martin 16 sailboats at the Community Sailing Center, so there’s a lot of opportunities for people with disabilities to sail,” said Brad Stevenson, a disabled sailor. “We like to say that we leave our dependence on the docks, you know when we go out sailing. That you’re out there and it’s just you and the boat and the wind and the water. And the boat’s designed so that it minimizes any of the physical components of sailing so that you are the skipper and working directly with nature and the elements at that point. There’s nothing more liberating than that,” said Patrick Standen with Northeast Disabled Athletic Association. EXCERPT: You’ll want to test your new sailing skills by renting a sailboat, which you can do at various locations around the lake. 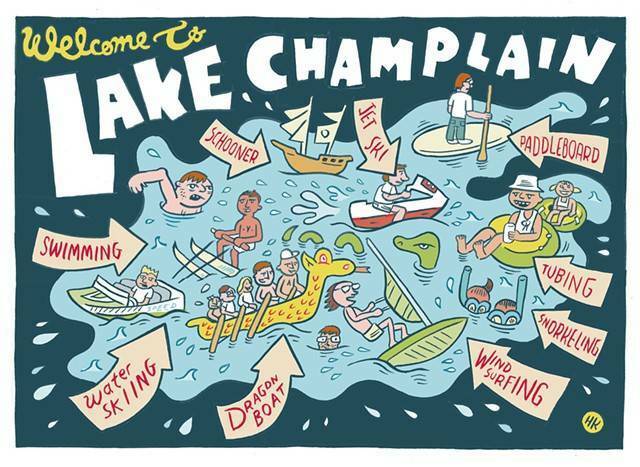 Burlington’s Lake Champlain Community Sailing Center, which also offers a host of sailing classes, charges $55 for an hour’s rental, and offers season passes ranging in price from $200 for a student to $725 for a family. The same organization’s Women in Wind program uses sailing to build confidence and leadership skills in Vermont girls and women. The program’s team-building activities — in sailing and SUP — are designed to foster self-confidence. The Community Sailing Center also offers an adaptive sailing program. In a partnership with Vermont Adaptive Ski and Sports, CSC’s program has been helping people with disabilities get on the lake since 1997. Its offerings include group and private sailing lessons, as well as sailboat, canoe and kayak rentals. To understand how Burlington’s frat boys, Birkenstock-wearing professors, and young professionals happily coexist in the town of 42,000, just look at the bulletin board at City Market, the organically stocked co-op and the only grocery downtown. Flyers advertise evening bike races, a jazz festival on Church Street, yoga retreats at nearby vineyards, and a global-health lecture at the University of Vermont (home to nearly 10,000 students). Situated on the shores of Lake Champlain, with the Green Mountains to the east and the Adirondacks to the west, Burlington’s residents have easy access to water and peaks. You can bike along Lake Champlain’s waterfront, rent a sailboat at the Community Sailing Center, cliff-jump at Red Rocks, or mountain-bike the Sunny Hollow trails. When frigid winter temperatures send other New Englanders inside, these hardy Vermonters are nordic skiing at the Intervale, snow kiting on frozen Champlain, or backcountry skiing near the Bolton Valley resort, just 30 minutes away. Look for a colonial home priced around $300,000 (citywide median: $259,500) in the diverse Old North End neighborhood, close to the lake. If you can’t land a job at UVM, try the health care sector or Burton, which is headquartered here (median household income: $43,135). What’s up with SUP? Stand Up Paddleboarding Event Coming Up! BFP: There’s a big paddleboard event coming up on Lake Champlain. Tell us all about it. Russ Scully: Ah yes, my favorite time of year. Stand Up for the Lake is an amazing event with a great cause. Kate Neubauer (the former executive director of the Lake Champlain Community Sailing Center) and I co-created the event back in 2009 as a way to promote the sport of stand up paddling while raising money for the Sailing Center. In the beginning, it was a group of friends getting together to race around a bunch of buoys in NASCAR fashion. It was largely local competitors who all knew each other, followed by a barbecue and some beers. Last year (2013) was the tipping point when it went from rag-tag to World Paddlers Association (WPA) sanctioned. We got serious about making it a destination event to attract top talent to the area. We registered approximately 50 paddlers — half of which came from outside the state — to compete in the event. This year I hit the greater New England race circuit to both compete and further promote our event to elite paddlers. Convincing competitors to come up to Burlington to paddle in a WPA sanctioned race is an easy sell. That being said, the event caters to more than just elite racers. We also run a 3-mile recreational race for those that want to have a race experience without the pressure of paddling against the elite group. We’ve also got a kids/youth race and a group relay race designed for fun as a throw back to those early NASCAR days.